This is Ramona. Ramona is really hoping that the little doggy in the window will be hers. Do you have a little dog that you had hoped for? 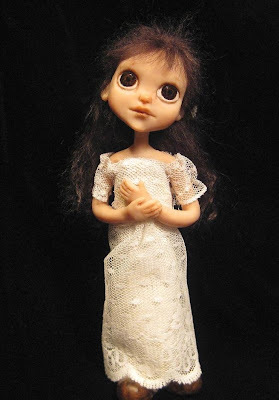 Ramona is #8 in my Kindred series and has a vintage lace overlay over her painted body/dress and stands just over 7" tall. I listed Ramona on Etsy last night. I'm hoping to start work on another Kindred today, however I also want to start a couple of faerie pieces. Should be a great day! Oh she's wonderful Sue! really love her and hope she gets that doggie in the window!!!! Ramona is so sweet. You can see the longing in her face. What a precious face Sue. I saw her on Flicker this morning and just went nuts! She is SOOOOOO cute! 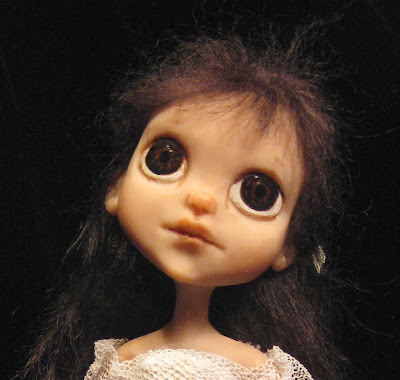 Reminds me of those big eyed painting of little girls I had in my bedroom growing up. Just too precious for words! this is such a darling piece, sue! It does capture the same longing as those Keane paintings. Her eyes just plead to be loved. Wonderful! Wow beautiful work! It's amazing to be able to convey emotion in an inanimate object. ooooooo, she's my favorite one so far! she's adorable! Unbelievable! Your work is SO exquisite. How can you give her up?? As always FANTASTIC....If I could afford all them I would have them on display right now...Love your work. Sue Ramona is just darling!! She has such an angelic little face, I would give her MY puppy!! I so appreciate everyone's comments! Just stunning as usual! I love her huge liquid eyes ^-^! Very touching piece.. love her!!! she is so beautiful! you are very talented!